As you might expect, interactive or video advertisements require much larger file sizes than static banner ads—meaning they will take a heck of a lot longer to load if executed poorly. Remember, rich media ads can be structured to provide a progressively deeper experience based on scaling customer interest, so you don’t need everything to load immediately. According to the IAB Rich Media Display Guidelines, a good strategy is for the initial ad the customer sees to involve a smaller file (just enough content to be attention-grabbing), and then a larger file will automatically load upon indication of consumer interest (i.e. mouseover or click-through). Offering the deepest, most exciting rich media consumer experience in the world won’t matter if customers don’t take that first step and engage with an ad. A common mistake advertisers make when implementing rich media mobile ads is putting all the focus on what happens post-click, and not making the most of that initial impression. 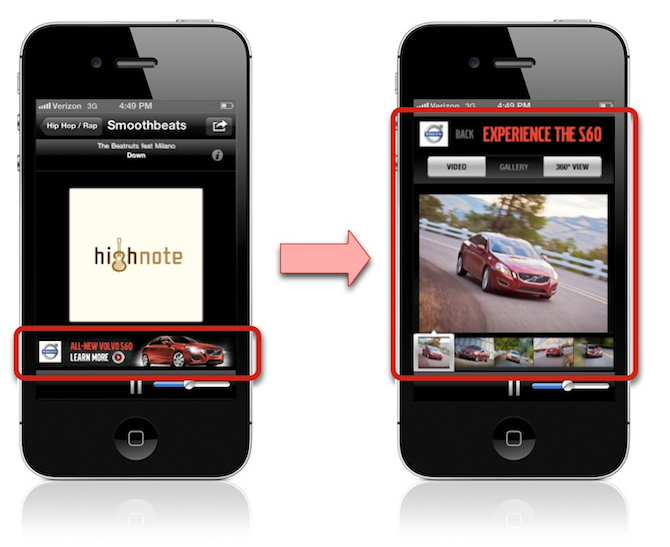 A rich media mobile experience can involve multiple layers of interactive engagement. Rich media allows for more than just a prettier ad, or an ad unit with a single embedded video. It’s better to think of rich media ads as a customer “experience,” allowing for layers of mobile engagement, media, and interactive functions. A short, promotional video can link to a longer, more informative one. 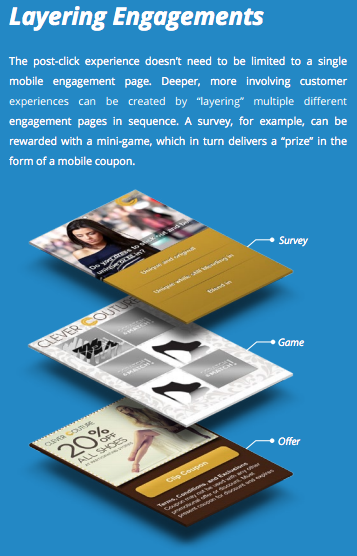 Interactive games can reward customers with rich media mobile coupons that can be redeemed with the press of a button (people love pressing buttons). With rich media mobile ads, the built-in touchscreen functionality allows for even more options to deepen the experience and generate engagement. Customers can be rewarded for titling, tapping, pinching, shaking, or swiping to progress through different layers of an ad. It goes without saying that any mobile ad should include options for the customer to share the promotion to all the major social sites. This not only increases brand visibility, it can lead to conversions at POS by turning each new person who shares an ad into an implied brand advocate in the eyes of their friends and family. And, because the overwhelming majority of time spent in social sites happens on mobile, your mobile audience is that much more likely to share an ad. In order to encourage social share, ads need either an intrinsically interesting creative element (we’ve all seen hilarious television commercials that go viral on Facebook), or a universally valuable promotion that customers know will benefit people in their social circle (typically a money-saving mobile coupon). In addition to social sharing, rich media mobile ads enable additional functionality for long-term customer engagement. Including an option for customers to opt-in to an SMS loyalty database is a win-win for brands and consumers alike. They’ll receive regular promotions from brands they care about, and you’ll grow a high-value, easily-remarketable list of consumers. 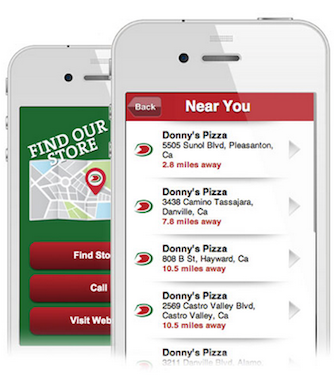 A “Store Finder” feature, accessible upon click-through of a mobile ad, can automatically generate map directions to the nearest physical location and drive local traffic. 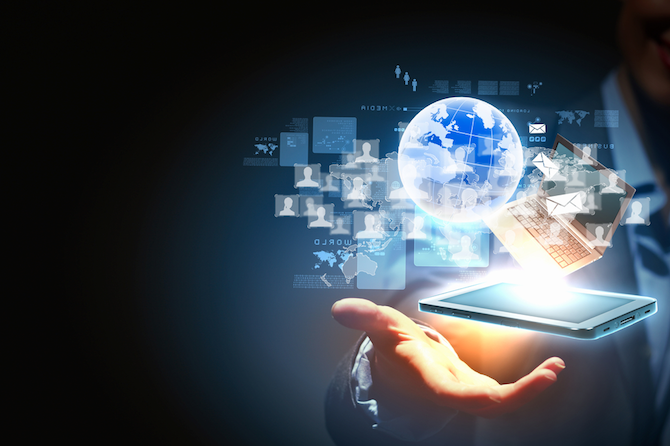 MRAID, or “Mobile Rich media Ad Interface Definitions” is the IAB Mobile Marketing Center of Excellence’s project to define a common API (Application Programming Interface) for mobile rich media ads as they appear in mobile apps. MRAID compatible mobile ads are not only more universally accessible, they employ best practices for design specs and standards, and deliver an average performance 26% better than non-compatible ads. Unlike rich media ads that redirect customers to a entirely different external page when clicked, MRAID compatible ads exist as an overlay on top of the existing app being used. This minimizes the disruption the ad creates for the consumer. Because the IAB represents 86% of online advertising in the United States, this means that MRAID compatible ads are the most universally accessible across different devices, operating systems, and mobile apps. Advertisers can save money by minimizing the number of different iterations of a mobile ad they’ll need to produce for apps (ideally, only one). 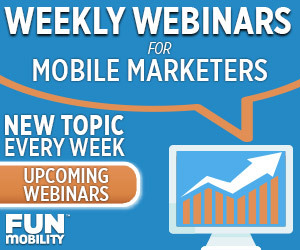 And when it comes to mobile devices, Flash simply isn’t a viable option. HTML5 is essential for mobile-capable rich media ads, as Flash offers no touchscreen functionality and simply does not work on Android devices or anything running iOS. Also, because Flash requires more processing power, it’s significantly slower to run. If you need proof, just try playing a few games of Pong—where the left half of the table is Flash and the right half is HTML5.